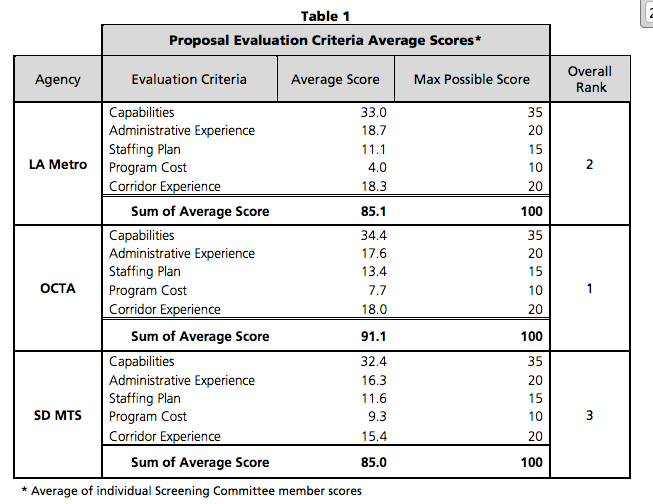 Chart from the ##http://www.sandag.org/uploads/meetingid/meetingid_3643_16429.pdf##LOSSAN Staff Report## scoring which agency should take over management of the Surfliner. It has been a while since I last wrote about the Pacific Surfliner and the process of it transitioning to local management. The first bit of news is the timetable that went into effect April 1st reflects that subsequently selected trips now serve stations of San Diego County’s Coaster commuter service that previously were not served by the Surfliner. The Rail Passenger Association of California & Nevada (RailPAC) has expressed concerns about this along with sharing same with Caltrans. In summary their complaint is “Degrading Intercity Schedules to cover gaps in Commuter Service a bad policy and contrary to State Rail Plan”. AFAIK our friends in Sacramento felt no need to respond to RailPAC or the issues it raised. Meanwhile San Diego transit agency NCTD finally accepted a revised by laws for the Los Angeles – San Diego – San Luis Obispo Rail Corridor Agency (LOSSAN) which will have ultimate responsibility for the Surfliner although it is to continue being operated by Amtrak and funded by the state of California. The next step is selection of a managing agency much as was recently done for the San Joaquin Amtrak route that serves the Central Valley plus the Bay Area and Sacramento. At the June 19th LOSSAN Board meeting the three agencies that have applied to be the managing agency for the Surfliner made presentations. These are Metro, OCTA and the San Diego Metropolitan Transit System. It is further stated in the report on the recommendation “The Member Agency CEOs discussed the Screening Committee’s recommendation at their August 5, 2013, meeting and did not have concerns. Each of the three proposing agencies has been asked by the Chair to provide an overview of their proposal at the Board meeting prior to the Board considering the Screening Committee’s recommendation”. Which means the selection of OCTA isn’t a done deal. Should be interesting how this all plays out. This will give it more power, a bigger budget and control over operations of the trains between San Diego and San Luis Obispo. LOSSAN’s job will be to increase ridership, revenue and improve service on the Surfliner trains. But it will also need to create more connections and increased transfers between the Surfliners with Metrolink and Coaster trains in San Diego County. The key to ridership growth will be better connections between services, seamless one ticket ticketing between services and competitive fares with other forms of transportation. To do this will require the different services to work together and coordinate their services. Too often now Metrolink and Surfliner trains miss each other sometimes by just minutes. LOSSAN is needed to do that with Amtrak, Metrolink and Coaster services plus the connections to local transit. There are many construction projects programmed on the LOSSAN Corridor. This includes several miles of double and triple tracking by 2018 in San Diego, Orange and Los Angeles Counties. Track and platform improvements for more trains are planned at Oceanside, Poinsettia Carlsbad and Van Nuys. There is a new station under construction now at Anaheim. The biggest news is the plan by 2017 for run-through tracks to be built at Los Angeles Union Station. More parking is also planned at many stations. They didn’t apply. Perhaps, with the leadership change and the financial audit problems, not to mention a fare increase which riders have not taken well, leading into an accelerated drop in ridership, they wanted to focus on their core mission first. Overall I think OCTA is a good compromise choice, because they are centrally located in the corridor and are not caught up in the Los Angeles vs. San Diego feud. I know Metro’s Don Sepulveda is an expert on regional rail issues, and is a regional leader on both freight and passenger rail projects, but what happens when Sepulveda leaves or is hired away somewhere else? You have to have an operation that is focused on commuter-type heavy rail (as opposed to light rail or subway) and that can perpetuate, and that’s what I think some of the steering members were concerned about.